The original members of the Joshua Light Show were resident artists at the Fillmore. From March 8, 1968, until the venue closed in on June 27,1971, the group performed multiple shows every weekend for up to a total of ten thousand people, receiving nearly equal billing to such acts as the Who, the Doors, the Grateful Dead, Janis Joplin, the Jimi Hendrix Experience, Albert King, Chuck Berry, and Iron Butterfly. Joshua White, who had studied electrical engineering, theatrical lighting, and magic-lantern techniques at Carnegie Tech and filmmaking at the University of Southern California, where he made a number of stop-motion and direct animation shorts, founded the group. 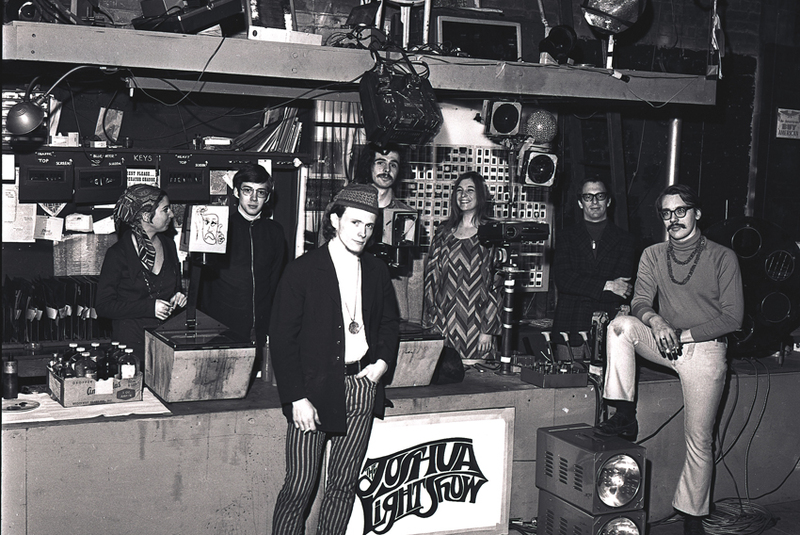 The JLS consisted of six to eight members during its initial run, with the most stable lineup including White, Tom Shoesmith, and Bill Schwarzbach, who met at Columbia University while studying theatrical lighting and electrical engineering; Cecily Hoyt, a photographer and painter; and Jane Ableman, an art student. The group employed a panoply of image-making apparatus to achieve diverse visual effects: three film projectors, two banks of four-carousel slide projectors, three overhead projectors, hundreds of color wheels, motorized reflectors made of such materials as aluminum foil, Mylar, and broken mirrors, two hair dryers, watercolors, oil colors, alcohol and glycerin, two crystal ashtrays, and dozens of clear glass clock crystals. White and his cohort designed a rear-projection system, situated roughly twenty feet behind the Fillmore stage, where several tons of equipment was arrayed on two elevated platforms. The fourth element was dubbed “lumia” and was a technique unique to the Joshua Light Show. The name comes from Thomas Wilfred’s color organ experiments, which began in the 1920s. Indeed, Wilfred’s work proved a profound influence on White, who recalls spending hours every week after high school looking at the artist’s boxes of swirling light at the Museum of Modern Art. In terms of the JLS performances, lumia was Shoesmith’s domain. While inspired by Wilfred, Shoesmith used very different methods of his own creation to shape the light. He occupied the top platform behind the Fillmore screen by himself, where he manipulated reflected and refracted light via a series of mirrors, reflective Mylar sheets, hand-built motorized broken mirror wheels, and projectors. And that is what the Joshua Light Show was and continues to be—a reservoir of the moving image’s memory, unmoored in an ephemeral celebration of its possibilities.